Add some color to your lights. Right now you can pick up the 4-bulb Philips Hue starter kit with a LightStrip Plus for $199.99. This is just over $90 less than it would run you to pick the two pieces up separately, and considering the LightStrip Plus is $90 by itself, that means you basically get it for free. 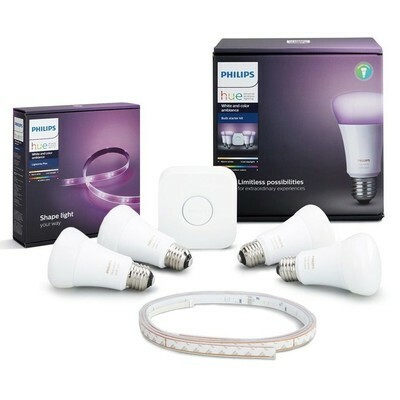 The White and Color ambiance starter kit comes with four color-changing bulbs and the Philips Hue Bridge, which is the hub needed to run all the lights. The LightStrip Plus is 80 inches long and can be extended beyond that with ease. All of this can be controlled using Google’s Assistant or Amazon’s Alexa, making it even more convenient. Of course, you can also use the free Philips Hue app on iOS and Android (which was recently updated) from anywhere in the world to set the lights the way you want. ← Get these games free with your PlayStation Plus membership this June!